Polaroid may have moved on from instant cameras but who's likely to buy this? We'd have thought that most people who watch movies and TV shows on their iPods have probably moved on from carrying about portable DVD players as well. But apparently - judging by its latest product - Polaroid Japan missed that meeting. The ¥28,000 (£125) DPJ-08580B goes on sale in Japan next week and mashes a standard DVD player into an 8.5-inch 234 x 480-pixel screen and a dock for 5G iPods, all in a single 1.1kg package. When not using it as a DVD player, it can show video from the iPod, which can take orders from the supplied remote control. 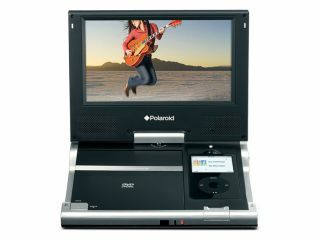 The dock space doubles up as a storage bay for the remote when the iPod isn't in use, plus there are two headphone jacks, so at least Polaroid put a little thought into the device. Otherwise, the screen swivels through 180 degrees, a headrest holder is included for clipping the player onto the back of a car seat and the battery stretches to just 150 minutes. At least you don't have to manically wave the thing in the air to see the picture.